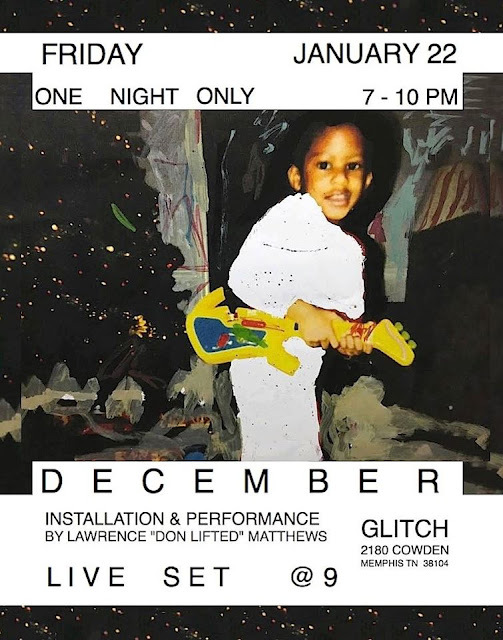 On Friday January 22nd Glitch will host a visual and alternative hip-hop artist, Lawrence “Don Lifted” Matthews. This exhibition will feature a multimedia installation including a selection of still-screen photographs and a live performance by the artist that will begin promptly at 9pm. Please join us as Matthews transforms the gallery space into a world of visual distortion and self-reflection. The work produced in this exhibition is heavily influenced by the loss of the artist's grandmother in 2012. Matthews' installation embodies the spirit of winter during his childhood by displaying old home videos of his family alongside 90's pop culture references on analog television sets. The performance will feature songs from his “The December LP” trilogy which juxtaposes the bliss of being a child with the struggle of age, loss, and depression throughout his college years. In addition, this installation contains four collaborations by Matthews and Adam Farmer which are for sale, as well as a full-scale wall mural currently in production to prepare for the opening. The exhibition and LIVE PERFORMANCE is FREE and open to the public!